My son and I went to this restaurant on December 8, 2017. It was recommended by our concierge at the Ritz Carlton. The setting is beautiful and we were seated steps from the ocean. My son and I shared an appetizer, salad, entree and dessert. Everything tasted delicious. We were very pleased. Within a half hour of returning to our hotel, we both got sick. This went on for 12 hours. As a result we had to cancel a snorkeling trip the next day and spent the rest of our vacation unable to eat or do anything. I reached out to the restaurnt upon my return and received no response. I was very disappointed by that. I would not recommend this restaurant to anyone! Finest food and staff on the island! If you are looking for an experience of eating on the beach barefoot, you are better off bringing your own food at a public beach after an enjoyable day at the beach. 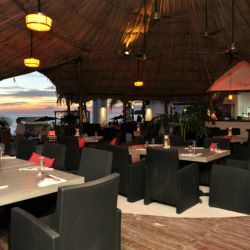 We went at night and while the tables in the middle of the beach are well lit most of them are in very dark areas and not only can you not read the menu you can't see your food that well. My food was bland with no flavor. My husband asked for his Tuna steak well done, the waitress suggested it to be cook raw so that it would not come out so dry and my husband said no he wanted it cooked alll the way through and when the Tuna came out it was pink and tasteless. My daughter's chicken nuggets tasted like rubber and her french fries cold. Save your money and ruin your night and go somewhere else. We arrived, sat outside, feet in the sand, beautiful sunset, food was delish, service was perfect! We rebooked for another night! 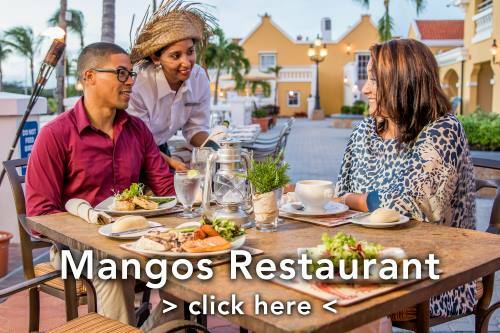 The BEST Restaurant in Aruba. Excellent Service from a young professional named Jordy, direct from Holland. Excellent food and a beautiful setting. Do not miss going to Barefoot....I wish there was a 11 rating!!!!! We enjoyed this place . The fact that airplanes were landing wasn't annoying to us , it was kinda nice to watch. The food itself was pretty good, not excellent but definitely not bad by all means. The sunset was spectacular but we had a man and his child playing in the water directly in front of where we were dining , and the photobomb was not so great for photos lol . Over the years I have had mixed reviews on Barefoot, but the past two years it had been tied with Papiamento for my favorite on the island. This year, my review is up in the air, and their new restaurant Quinta del Carmen surely gave Barefoot a run for their money. 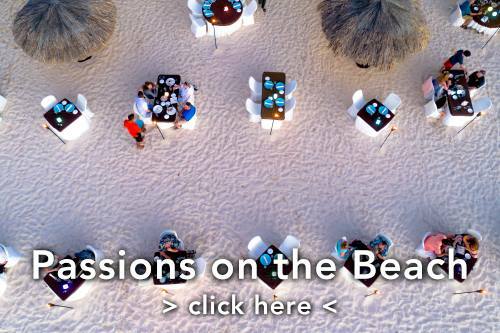 Obviously the setting is beautiful as usual....dining under a huge palapa, or on the beach, with plenty of room between tables at both locations. 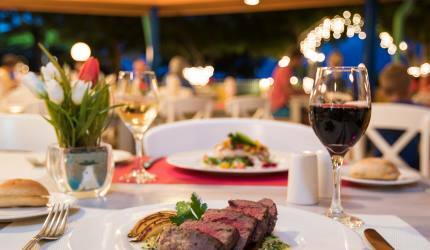 Right next to the airport runway, dining can get "interesting" on the beach. Service is good but not great. They give server internships to girls from the Netherlands who are not well trained. I like the idea but they should train better or have more experienced servers with the interns until they "get their feet wet." Our server was polite and tried hard, but sometimes seemed so lost that I wondered if there was a language barrier, knowing all along that there was not. In terms of the food, it is still very good, but not fantastic like the past years. Had my favorite goat cheese medallion salad, but there surely weren't medallions as in the past....rather 3 slivers of goat cheese. Still very flavorful and dressed nicely. The tomato soup is still a hit! The grouper was fresh and tasty, but a bit overcooked for such a delicious fresh fish. And one of our entrees came out completely wrong, even though the server wrote it down correctly. Overall a decent meal and we will go back...just hoping they don't slip due to cutting corners or trying to become another tourist trap. This is a great spot for dinner. The ambiance is great and the food can't miss. 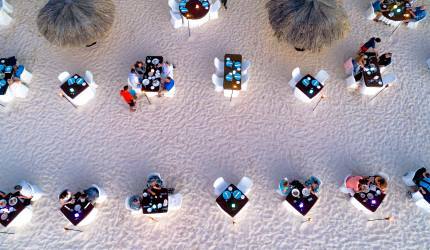 If you are lucky enough to get a beach side table, the sunset is amazing, but all the seating is great in this restaurant. Barefoot is always on my list when I'm in Aruba! This was our second time to Barefoot and the experience was great once again! We had reservations and when we arrived, we were given a choice of sitting on the beach or on the deck. The kids chose the beach, of course. Our meal was wonderful, as was the service. We can't wait to return!